The Flosstradamus kit is the newest vape pen released by Source Vapes, and it improves on their newly released Source XL model. This review will cover how the Flosstradamus works, battery life, vapor quality, and our final thoughts on whether you should buy one or not. 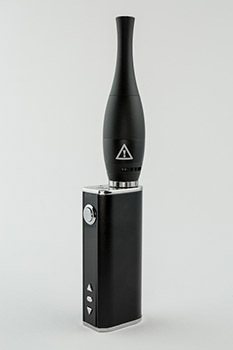 If you’re looking to buy the Flosstradamus, Click Here to be taken to VAPORIZER CHIEF, which is the best deal online. The Flosstradamus is pretty simple overall. Just like all of Source’s products, you first load up the atomizer with your concentrate of choice, roughly about 0.1-0.3 grams. You may be able to fit more, but this is the optimal load size from what I’ve found. The battery for this kit is a bit different that Source usually does, as it is a box instead of the usual stick batteries. It is essentially a 30w (watt) box mod like most electronic cigarettes use. You turn it on with the same 5 clicks, but instead of having a dial on the base, you have two arrows to increase or decrease your watts/volts. There is also a screen that displays what your voltage/wattage is, what ohms your coil is resting at, as well as display how much time has elapsed after pressing the button (this battery will also cut off the power after 10 seconds, like most batteries). The battery has a higher amount of power so that it can get enough energy to the coils to vape effectively, because these coils are massive. The two larger coils that come with the Flosstradamus kit clock in at 0.6 ohms for the resistance. I will not be going into ohms law at this time, but here is a good decription of what ohms are and what they mean. 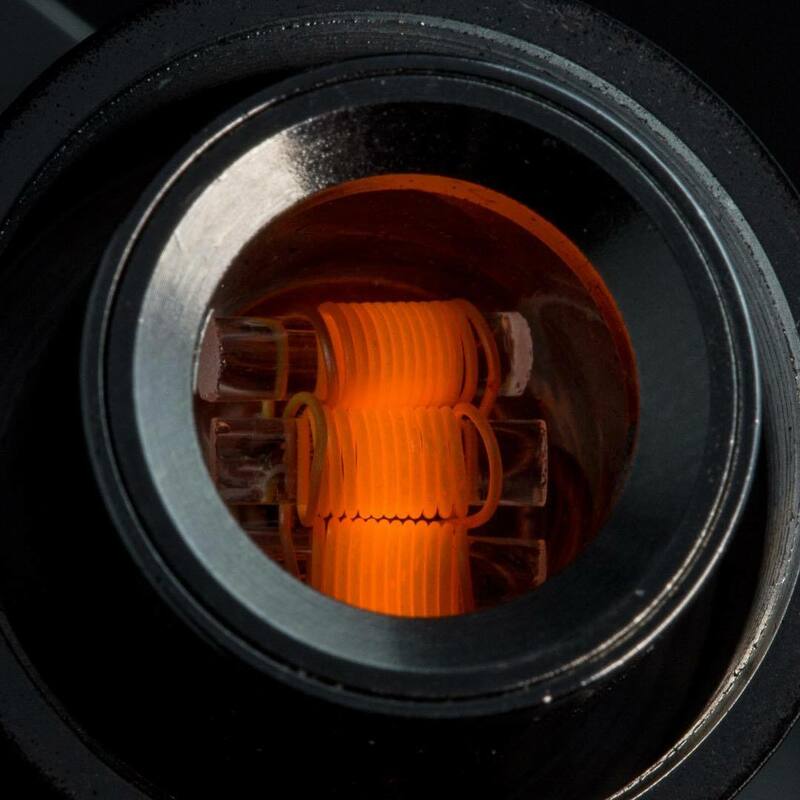 These are actually the same coils that are in the Source XL kit, and because the wires themselves are physically thicker, and there is a lot more of it, it takes more power to heat the coils to the same “temperature” (so to speak). That is really the main reason that they ship this kit with an upgraded battery. The battery life is decent, but it is by no means fool proof. You can get a decent amount out of it, probably 3-4 sessions, but then you have to wait hours for it to charge up. Granted, this is because of the much larger coil, which gives you way more vapor production, but that’s a trade off you have to consider. The battery also has a range of 5 watts to 30 watts, so the heat of the coil is much more controllable than voltage based models. This let’s you do more, but again, the battery life tends to be lower, so you need to consider that. The vapor you can get out of this thing is phenomenal. Because of the large coil size, you can get those low temps that are harder to achieve with some smaller coils, making the whole experience much smoother. This vape also works really well with waterpipes, if you set it up right. I took the whip from one of my desktops and hooked it through my waterpipe, and cranked the power way up. It was a very similar experience to hitting an e-nail, but with a bit less control-ability on temperature. Overall, the Flosstradamus is a great setup. It gives you everything you need, plus the largest coils you can buy on the market for concentrates. If you were interested in the Source XL, this is really the same thing, just with a better battery that lets you do more. At $119.95, it is a bit pricey, but it is worth every penny for the vape experience you get. Don’t pass this one up if you get the chance. Where to Buy the SOURCE Flosstradamus? As we do with all our products, we recommend buying it from Vaporizer Chief. The Chief has amazing customer support and will always look for the best way to help you if you run into problems with the unit. Also, you won’t find it cheaper anywhere else.